I’m sure that a lot of you that do save stereoscopic 3D screenshots from games they play are not very happy with the level of quality they get in the saved JPS files (JPEGs in Side by Side format). The reason for that is the fact that Nvidia set the default level of quality to 50%, probably in order to have smaller files, but I’m sure that for 99% of the people it is the quality that matters more than the file size, right? Anyway, the good news is that the level of quality can be adjusted from within the Registry, so you can increase it if you wish to and let me tell you how this can be easily done. 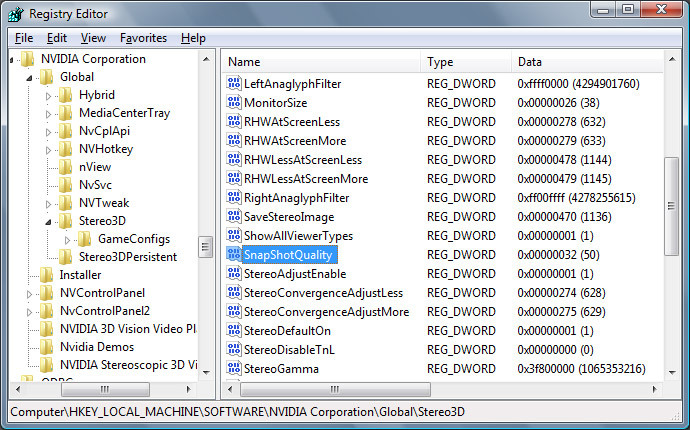 You need to run Regedit and navigate to the following place in the registry depending on your OS and then just change the value of SnapShotQuality to the desired level of quality. The value is represented in percents in decimal numbers, so when you change it you need to enter decimal and not HEX values (HEX is still Ok if you input the right value, because 50 in HEX is equal to the number 80 in decimal!). So the default value you’ll see is 50 in decimal meaning 50 percent quality which gives a smaller file, but a lot of visual artifacts due to the compression of the image, so you definitely need to increase that value. Have in mind that 99 is the maximum value you need to enter in order to get the highest quality level, if you input 100 or more you’ll actually get 75 as a quality level instead, so be careful that you input 99 in decimal as maximum number to get the highest possible quality! I did some comparisons of screenshots done in stereo 3D with different quality levels in order to see the difference in file size and also to check a few important things and verify some of the limitations that you may face when using the built-in stereo screenshot capture functionality in the 3D Vision driver invoked by presing the ALT + F1 key combination. As you can see in the image above with quality level 1 you get a really small file, but the quality is so bad that it is practically useless, at the default quality level of 50 you still get quite small file, with a decent quality, but not good enough as there are quite a lot of visual artifacts due to the compression. I’ve found out that the default setting for good ratio between quality and file size should actually be set to around 80 as then you have very little and hard to see compression artifacts and the file size is still quite small. This is probably the best option if you want to directly share the stereo 3D screenshots you make with other people over the internet without having to edit them in any way. If you don’t care about the file size you can directly go to 99 (the maximum quality level) to get the best visual quality, although with over 3 times the file size of the screenshots at quality level of 80, but then again you can edit these and compress them if needed later on to share online. I would also want to direct your attention to the naming convention of the screenshots that get saved under your User account in the Documents folder in a specially named NVStereoscopic3D.IMG folder. For the example above I’ve used the built-in stereo 3D test application in the 3D Vision driver and the name of the file is as follows: nvsttest01_50.jps. The first part of the file name “nvsttest” represent the executable name of the application you took the screenshot in, after that comes the number 01 that represents the number of the screenshot from that application, then a separator “_” and the number 50 which is the quality level of the screenshot. I’m directing your attention to this naming convention as it is directly related to some limitations you’ll be facing when taking screenshots due to the fact that both numbers are fixed at only two digits. This means that you can save up to 99 stereo 3D screenshots form a certain application, then you need to move the screenshots from the default folder for the software to start from 01 again, otherwise if you leave them you just won’t get any more screenshots saved! The same also applies to the quality level and that is the reason why you cannot set 100 as a quality level for example and the 99 is the maximum number you can set for optimum quality. My computer saves them as PNG stereo files instead of JPG. I wonder why? Does the driver change your screenshot file format based on your computer’s specs? It’s annoying having to convert them to stereo JPGs for uploading. No, there is another registry setting for whether to save them as PNG vs. JPG. This JPG setting is highly annoying because it gets reset every time you install new drivers, clean or not. Here is a small Batch file that you can run at anytime to set it to whatever you want. I set it to 85. If you drop it into your startup folder, it will set it to what you want at every boot. REM Modify the NVidia dword for SnapShotQuality. $55 is 85 decimal.